CR-100. Mikhail Voskresensky. Mozart. Piano concerti vol.1 (concerti no.13, 19, 23) - Classical records - compact discs with classical music, CDs online shop. He is the only pianist in Russia to perform all of Chopin's piano compositions during one concert season (in 1982-83, in nine recitals in the Maly Hall of the Moscow Conservatoire). 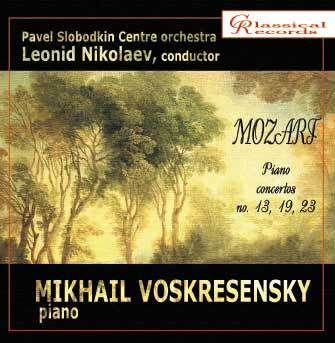 Mikhail Voskresensky began his pedagogical activities at the Moscow Conservatoire in 1959. For 8 years, he was an assistant to Professor Lev Oborin; since 1963 he has his own class. At present, Professor Voskresensky is the Head of piano chair at the Moscow Conservatoire. His pupils have won 111 prizes in international competitions, among them 49 gold medals. He has participated as juror for international competitions in London, Leeds, Sydney, Tel Aviv and others as well as for the Tchaikovsky and Rachmaninov Competitions in Moscow. He continues to be Chairman of the Jury for the Scriabin International Competition in Moscow. Mikhail Voskresensky is the President of the Scriabin International Society, and Guest Professor in the Toho Gakuen School in Tokyo. Professor Voskresensky gives numerous master classes in Russia and abroad. In the last 3 years, he gave master classes in Bejing, Lissabon, Paris, and Tokyo. The Julliard School invited Professor Voskresensky to teach for the period of three weeks in this famous stronghold of American pianism. 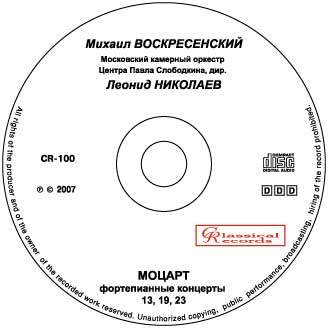 This CD is dedicated to the memory of Ekaterina, Mikhail Voskresensky’s daughter , a brilliant pianist, who tragically died in a car accident in 1994. Leonid Nikolaev studied at the Moscow Conservatoire with Boris Khaikin and Aron Shereshevsky. He was on special course in Vienna with a famous conductor Hans Swarovski. In 1974, he won Grand Prix of Herbert von Karajan Fund at the International Symphony orchestra competition in Berlin. Together with Leonid Slatkin and Zubin Mehta, he was the principal of the Russian-American International Youth orchestra from the moment of its creation in 1988. He recorded many CDs with music of Tchaikovsky, Beethoven, Berlioz, Shostakovich... Together with Mikhail Voskresensky, he recorded 2nd Piano concerto by Chopin with Great Radio and TV Symphony orchestra. He appeared in all European countries, in Cuba, USA, Japan. He is a professor of the Moscow Conservatoire. Do you have any questions about CR-100. Mikhail Voskresensky. Mozart. Piano concerti vol.1 (concerti no.13, 19, 23)?